Most writers don’t like to think that they’re recycling or reusing material. We like to create fresh ideas with new perspectives. Yet, when we’re honest we tend to like certain authors because in some way they are repeating a type of voice that we like to read. From a certain way of viewing their work, most great writers reduce, reuse and recycle their best ideas, style and voice. 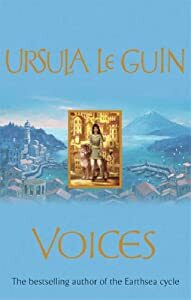 Yesterday, as I was waiting in lines for various recyclers to take my stuff, I began reading an Ursula Le Guin book, Voices, published in 2006.Reading her book gave me some ideas about how we as writers might choose to reduce, reuse and recycle our own writing. So, I thought I’d offer her book as a bit of a case study for the 3 R’s at work in writing.The first thing that I saw when I opened Voices was a hymn and then a map of the Western Shores. I immediately thought of EarthSea. Readers who like EarthSea not only don’t mind, but actually want Le Guin to re-use a style of writing and a group of characters that feel familiar. Recycling our stories however often requires that we change something to make it useful again. In this case, Voices offers a new world and familiar but slightly new themes. This book deals with the place of women in the world and the magic of writing and reading in a refreshed way from her earlier books. I won’t give away the story, but this first line is spare and perfect and tells us what the story will be about. If you think about your favorite writers and stories, can you see evidence of where they reduce, reuse and recycle? How might you reduce, reuse and recycle your work in a way that your readers would appreciate? I absolutely adore Helen Fielding’s Bridget Jones’s Diary. And, obviously, it’s a total redux of Jane Austen’s Pride & Prejudice. I love Le Guin and also her poetry. This blog is helpful and well done. Thanks. Le Guin is one of my favorite fantasy and sci-fi writers! And thank you for the kind words about this post!